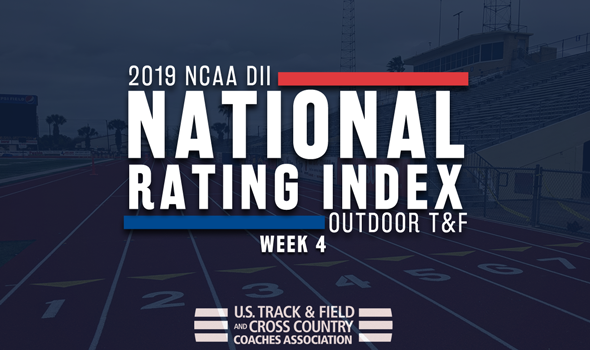 NEW ORLEANS – While the top teams on the men’s and women’s side of the NCAA Division II Outdoor Track & Field National Rating Index held their spots atop the throne, the rest of the nation experienced heavy change in the most recent installment, which was released on Tuesday by the U.S. Track & Field and Cross Country Coaches Association (USTFCCCA). Twenty-two of the top-25 men’s teams and 24 of the top-25 women’s teams shifted spots between Week 1 and Week 2. Expect even more change as teams are battling for the top prize at the 2019 NCAA Division II Outdoor Track & Field Championships, set for May 23-25 in Kingsville, Texas. For the third consecutive week Angelo State is the top team in the country. The Rams have looked strong across multiple disciplines to start off the outdoor season, but watched its field group dominate this past weekend at their David Noble Relays. Top performances came out of Decio Andrade (leads the nation in the hammer throw), Nils Fischer (second in the javelin), Trpimir Siroki (second in the decathlon) and Matthew Walksh (fifth in the triple jump). The group’s 4×100 unit is also now ranked second in the country. Jumping up one spot to No. 2 was West Texas A&M which is the best mark in program history. The Buffaloes had a successful weekend at their WT Classic & Multi and were led by top performers in Quinton Sansing (now second in the nation in the 400 and seventh overall in the 200) and William Frobe (tops the nation in the 400H). Making a 72-spot leap up to No. 3 was Lincoln (Mo.) which is the best mark received by the program since the final iteration of the 2017 regular season. The Blue Tigers had a great weekend at the Mizzou Spring Open as they added numerous individual performance into the TFRI. The best came from Javan Gray (now leads the country in the 200 and fifth overall in the 100), Ryan Brown (first in the triple jump and sixth in the long jump) and Raymone Campbell (fourth in the 200 and ninth in the 100). The team’s 4×100 unit also ran the best time in the nation so far this season. Also making a leap was No. 4 Texas A&M-Commerce who climbed up three spots from the previous index. The Lions are fresh off competition at the Angelo State David Noble Relays in which they were led by Josh Boateng (No. 1 in the discus), Hudson Hull (fifth in the pole vault) and the program’s 4×400 and 4×100 teams (who are now ranked fourth and fifth, respectively). Rounding out the top-five was Grand Valley State which is no change from the week before. The Lakers were split between the Hilltopper Relays and the Spartan Invitational. The group saw top performances out of Daniel Walker (second overall in the 400H) and Hunter Weeks (fifth in the high jump). The rest of the top-10 was rounded out in the following order; St. Augustine’s, Ashland, Texas A&M-Kingsville, Tiffin, Academy of Art. Ashland jumped up 14 spots while Texas A&M-Kingsville and Tiffin each saw a eight-spot increase. The largest improvement overall was seen from No. 47 Bowie State who shot up 87 spots from its previous position. Other large jumps were taken by No. 35 Fort Hays State (up 57 spots), No. 61 Sioux Falls (up 57), No. 60 Lubbock Christian (up 54) and No. 42 Minnesota State (up 46). For the second week in a row, the Lakers from Grand Valley State were calculated as the No. 1 team in the country. It is the first time that the program has been the top team for consecutive weeks since a four-week run during the 2014 season. GVSU had athletes at both the Hilltopper Relays and the Spartan Invitational over the weekend. The Lakers were led by its pole vaulting group of Ellianne Kimes (tops the nation in the event) and the trio of Rachel Dolan, Lucy Buckholz and Kassidie Stimmel (all tied for fourth overall). Bobbie Goodwin also had a great weekend as she now sits sixth overall in the hammer throw. Advancing two spots to No. 2 was Angelo State after a solid weekend at its David Noble Relays. The Rams had standouts across the board which included Karlea Huhon (second in the nation in the heptathlon), Talena Murray (second in the javelin), Daisy Osakue (third in the shot put), Kaitlyn Matthews (third in the triple jump) and the group’s 4×100 relay (fourth overall). Also climbing up two spots to a new-program best No. 3 was Missouri Southern who had athletes at both the SBU Invite and the Angelo State David Noble Relays. The Lions saw some of the best showings in the nation in Desirea Buerge (second in the country in both the shout and discus), Emily Presley (second in the pole vault) and Jasmine Deckard (fifth in the 200 and seventh in the 100). Making the huge leap up 51 spots to No. 4 was Lincoln (Mo.) as the program jumped into the top-5 for the first time this season. It was all about the sprints for the Blue Tigers, who were led at the Mizzou Spring Open by Rene Medley (best in the nation in the 100 and second overall in the 200), Renea Ambersley (first in the 400) and Christine Moss (second in the 400 and fourth in the 200). The program’s 4×100 also now leads the country while the 4×400 is ranked third overall. Completing the top-5 at No. 5 was West Texas A&M after weekend competition at its WT Classic & Multi. The Lady Buffs got top performances out of Fatim Affessi (tops in the long jump), Zada Swoopes (seventh in the discus) and its 4×100 unit (fifth in the country). The rest of the top-10 was completed by Adams State, Pittsburg State, Saint Augustine’s, SF State and Alaska Anchorage, in that order. Adams State had the biggest improvement of this group after a 12-spot increase from its previous position. The biggest improvement in the top-25 was seen by No. 20 Lindenwood as the program soared 60 spots between Week 1 and Week 2. The largest improvement overall was taken by No. 46 Minnesota State (up 80 spots), while other large leaps were taken by No. 57 Cedarville (up 70 spots), No. 62 Malone (up 70), No. 89 Adelphi (up 58) and No. 87 Winona State (up 55).